Product Testimonials with photos for the Slo-Poke Jigs. If you have a Bait Rigs product testimonial that you would like displayed here, please to go to our Contact Page we will review it for posting. If we post your story we will give you a $10 product credit. For casting weeds, swimming or long line dragging a jig, I switch to a slow fall Slo-Poke Jig. The Slo-Poke Jig is the original slow fall jig and it is still the best one on the market today. I have been using this tournament-winning jig since 1988 and it is an awesome jig. Like the Slo-Poke, it stands up while on the bottom, with the hook upwards, but the Slo-Poke is a weight-centered, narrower design, so it stays horizontal on the fall and retrieve and does not plunge head first into snags like a ball jig. This well-balanced jig is the ultimate head for fishing structure. The Slo-Poke's swimmer head design slips through weeds, wood and over rocks. It also comes with a good, strong hook for maximum hook-ups on fish. My favorite colors are as follows: I use Chartreuse or Chartreuse/Green, Chartreuse/Orange most often. The Hot Green is my favorite Slo-Poke color in clear water. Hot orange or 14kt Gold are my favorite colors in stained, tanic acid or dirty water. 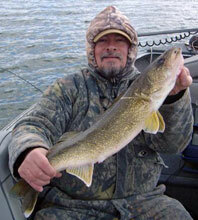 Daryl has won me over $150,000 on the Professional Walleye Trail, including the Walleye Super Pro. I love your website and your products, especially the Slo-poke Jig in Firetiger. I use it all the time and have convinced my fishing buddies that it's a great jig. 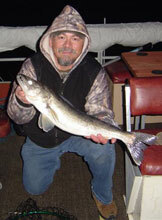 I'm sending some photos of walleyes that I recently caught using it. Thanks! 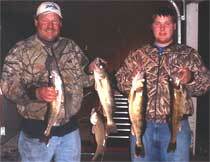 My Family has been using the Slo-Poke Jig for years fishing Devils Lake in North Dakota. I have sent these pictures to show just some of our success with the Slo-Poke Jig. This year we started using the New Blue Moon color, it is been unbelievably successful for us.